Total Detox...Are You Up For It? As far as the eye could see, there was sea. Bathwater warm, punctuated by leaping porpoises, the occasional hump of an island in the distance. Royal blue, turquoise, full of life. The ironwood deck, smooth and clean, stretched to the bow of the ship Katharina, soft spume hitting our faces. The sun was brilliant, but shadowed by the big canvas covering that provided daytime shade. Around the deck was a variety of chairs, including cushioned areas where you could stretch out and nap. Come on, man, when’s the last time you did that? 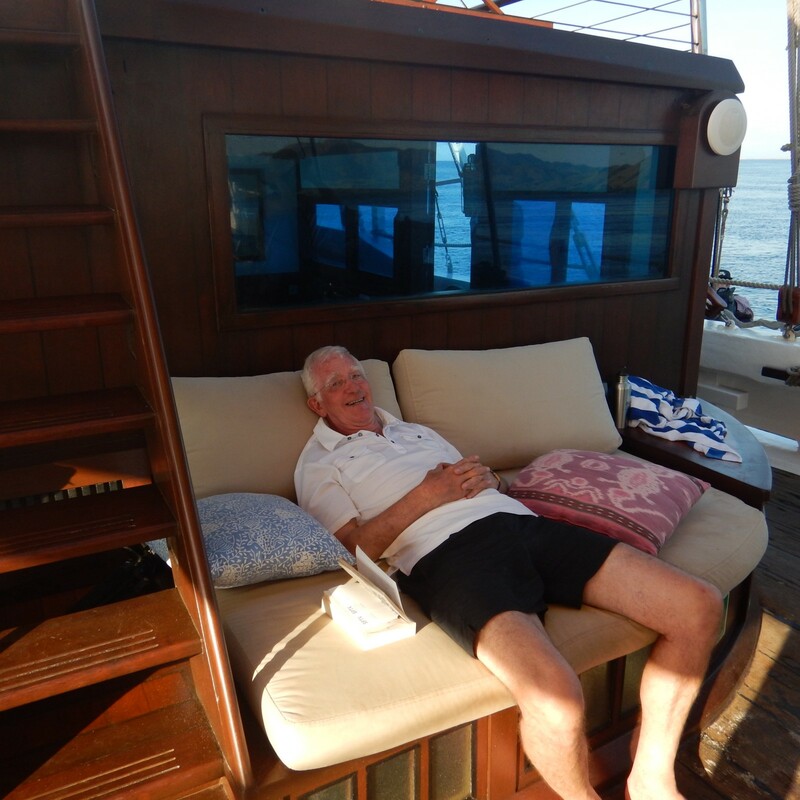 Just head to a quiet corner, put your feet up, and snooze a few hours away, rocked quietly into complacency by the smooth movement of a huge sailing ship, only the occasional small cool drop of seawater stroking your face? The Katharina on lovely warm waters. 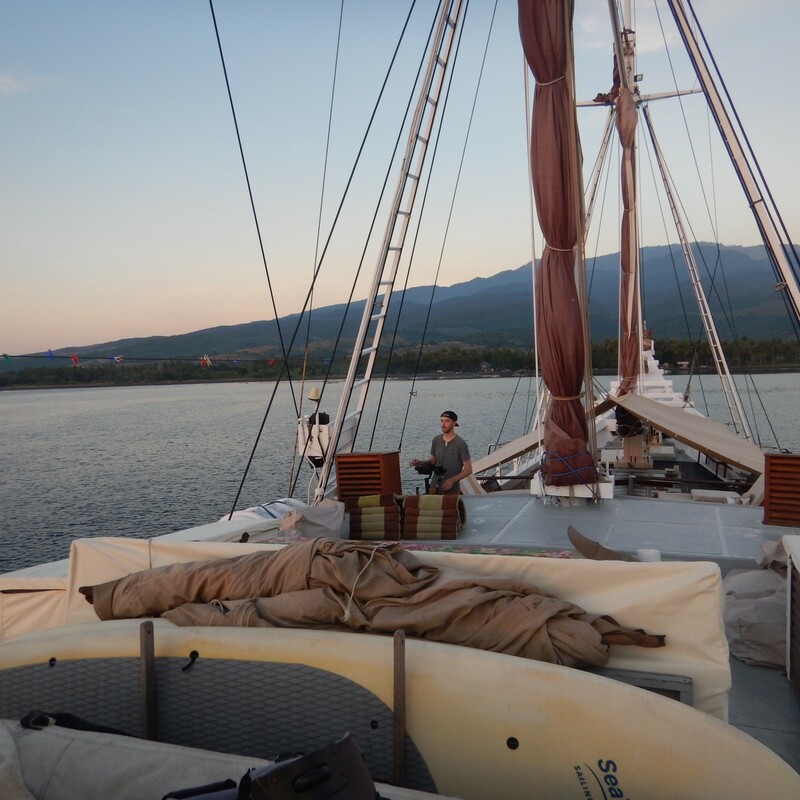 The Katharina (www.SeaTrekBali.com) is one of two sailing ships owned by a sailing+conservation company out of Bali. 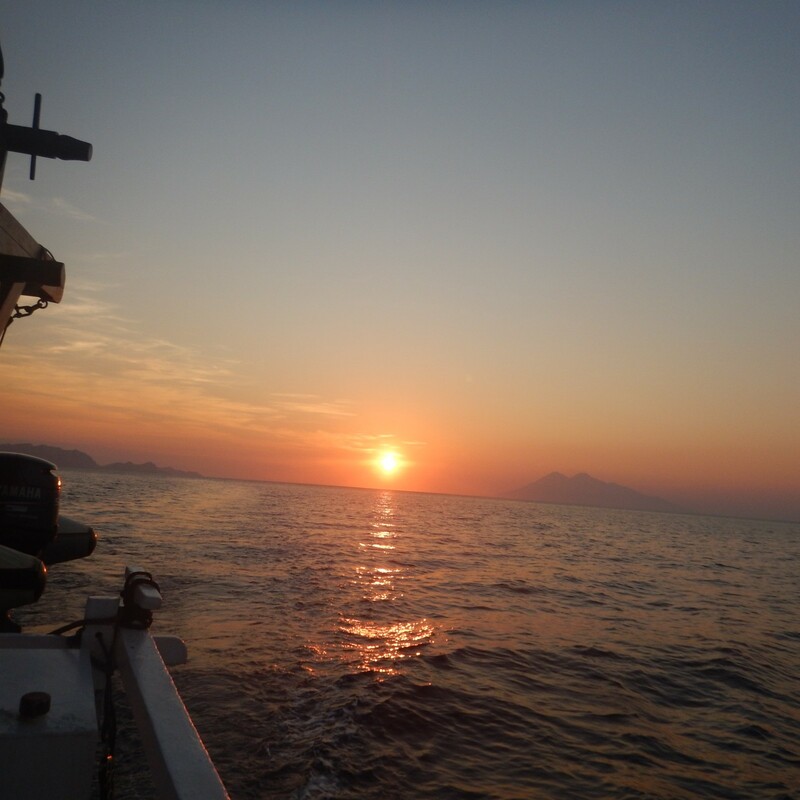 Its lovely lines form a poetic story as you sail from island to island, but perhaps its greatest gift is that shortly out of port, there is no wifi. I’ll ask again: when’s the last time you did that? Ever? These days it’s harder yet to reach a point in the wilderness where you can’t get a signal, aren’t bombarded with 4000–10000 ads a day, aren’t fending off fake threats of an IRS lawsuit, aren’t consumed by a myriad of (largely useless) life details. Yet out here in the wonderland that is 18,000 islands of Indonesia, paradise, release and relaxation are indeed still available. This is what real “detox” looks like, feels like, smells like. A complete emotional and physical makeover, a way to touch those parts of yourself that you didn’t even know existed. Roger, hanging out in luxury. For many, the experience of being unable to get a signal is disconcerting for a day or two. Then, a certain magic seeps in. The ability to turn off the noise, the constant invasion of your space becomes the gift it was always meant to be. Suddenly there is room to think. Really think. Think expansively. Creatively. As you take real time to relax, you also relearn the exquisite skill of genteel conversation. Those who have joined you on this cruise are from…well, everywhere. England. Australia. America. 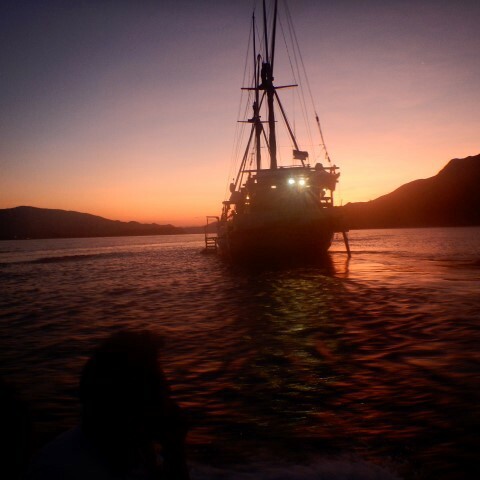 And of course, the Balinese crew who tend to your every need, whether it’s a midday gin and tonic (WHAT? on a TUESDAY? Damned right.) or help with laundry. You suddenly have the gift of time. Time and silence. Two gifts that have become so rare, so finite, that we hardly know that they exist. Real silence, the kind you get lying on the deck watching a breathtaking sunset that seems to last for hours, allows you to consider. What a rare thing, to be able to consider. What’s really important to you? What do you really and truly want out of life? When does anyone gain this gift of being able to assess one’s life, one’s options…the things that matter most? Slow sunset from the top deck. While each of us defines happiness variously, in all my world travels one thing returns repeatedly: the ability to disengage from those things that hijack our attention, that steal our time of life, is paramount. That way we can step back, particularly when surrounded by spectacular beauty, and take stock of who we are, where we are and what genuinely matters. Eight days on the Katharina spread out like a smorgasboard, each day filled with a wholly different adventure. You can SUP, kayak, snorkel, hike… or not. For some on our ship who were old enough to recall a time of rotary phones and no internet, it was a return to a way of being before the internet became such a driving force. For others born into this word of uber-connectivity it was slightly more disconcerting, but still a journey into a way of being that didn’t involve constant interaction. The interaction was there but with each other. With the environment. The night skies. The slow sussuration of soft waves slapping against the hull. The quiet rhythm of excellent foods and drinks, the chance to flop on a bean bag on the top deck and do…..
Lyman, from Montana, taking in the early morning. For many Bali is a party place, for others it’s a land of resorts. For those who truly wish to do the deep dive, heading out to sea on a ship like the Katharinais the real deal. This is the complete decoupling from society’s demands, and a way to explore the islands away from throngs of tourists, and the time to shove all those devices (except perhaps your Kindle) into the berth drawers and simply meet the new day with wonder and curiosity. My father’s family on his mother’s side were all Prestons, sea going people for whom a shop at the far end of Long Island is still named (http://www.prestons.com/) For 138 years that tradition has lasted. My father was also a sailing man. I wasn’t. I took up horseback riding, and other sports. The Katharina was my first true foray into the world of my ancestors. Nature is the one great, vast and magnificent place where we can come to terms with our humanity, and ask the larger questions about what we care about most. Given the gifts of time and silence, the answers appear. Big thanks to www.medium.com for the story.